Admit it: You often look in awe at celebrities. And who could blame you? The work they do, the lives they live – it’s all so glamorous! But the truth is that some celebrities are making big credit card mistakes, mistakes you should do your best to avoid. For a few examples, take a look at the details below. You might not be surprised at what you find. Famous actors make a lot of money, so most people assume they’re able to pay their credit card bills without a problem. As it turns out, that’s not always the case. In 2009, actor Stephen Baldwin filed for bankruptcy in New York. In addition to being deep in debt on two mortgages and back taxes, court documents also show that this Baldwin brother owed more than $70,000 on credit cards. This goes to show that no matter how much you’re earning, spending too much will always catch up with you. In May 2014, former “Saturday Night Live” co-stars Seth Myers and Amy Poehler went out to dinner together. At the end of the evening, after they had split the bill, Poehler accidentally (we think) walked out of the restaurant with Myers’ credit card. Even celebrities have embarrassing money moments, and actress Lindsay Lohan got hit with a doozy in August 2014. She attempted to pay a $2,500 bar tab at a swanky nightclub in New York City with her credit card, only to have it declined. The reason she was unable to use her credit card isn’t clear, but one possibility is that she maxed out. If this is the case, she should worry about her credit score. Maxing out a credit card will damage the 30% of her score determined by “amounts owed.” Plus, if the bill isn’t paid in full by its due date, she’ll also be facing some hefty interest charges. The takeaway: It turns out that we can learn a lot from celebrity credit card mistakes. Be sure to avoid their missteps by following the Nerds’ tips. 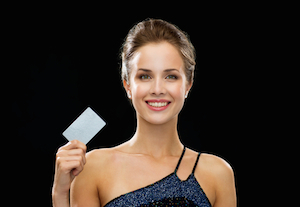 Celebrity credit card image via Shutterstock.